Syncios Manager for Mac is the best free iTunes alternative to easily manage iPhone, iPad and iPod without iTunes, which offers you ultimate transfer solution between iOS devices and Mac. Ultimate file transfer solution between Mac & iOS devices. Free iOS Manager: Music, videos, photos, apps, ebooks, contacts, messages, whatsapp, bookmark history and more. One click backup and restore data in lossless quality at any time. Extract files from iTunes Backup. Support iOS 6, iOS 7, iOS 8, iOS 9, iOS 10, iOS 11 and iOS 12. Note: iTunes is required in your Mac. 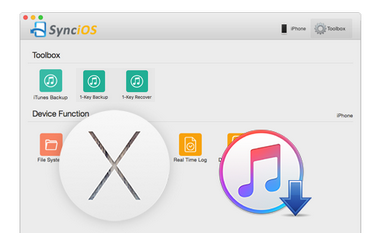 No need to run iTunes when using Syncios. 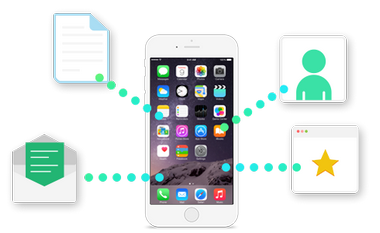 Syncios makes managing your iPhone information breathtakingly easy. With the clear working panel, you can backup and recover contacts, notes, bookmarks, SMS and Call history without trouble. Your media collection, including music, video, ringtone, voice memos is an important part of every day life, but iTunes doesn't always let you manage your music the way you'd like. However, Syncios has your back. Backup or Sync all media files including music,video, ringtone, Podcasts, audiobooks,TV Shows, MV, voice memos, iTunes U from iDevice to Mac & iTunes. Get control of playlists. 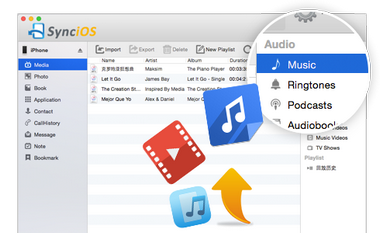 Rebuild or export your playlists from your Mac or iTunes. Take full control over your personal apps . Backup, transfer and restore the apps and files you wish. 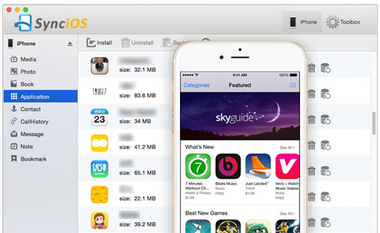 Install and remove any app on iPad/iPhone/iPod freely. Simple and secure apps management for you! Install application from Mac to any iOS device without iTunes. 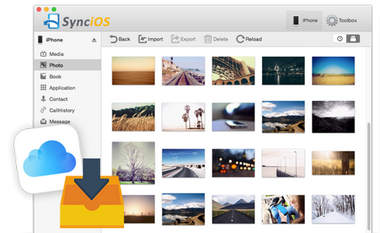 Syncios provides a simple solution to transfer and manage photos between iPhone/iPad/iPod, iCloud Photo Stream and Mac. Edit/remove/create folders and add photos straight to your iPad/iPhone/iPod. Add photos from Mac to your iPhone, iPad or iPod and edit photo albums. Export photos from iDevice to Mac. Download photos from iCloud Photo Stream to Mac. Transfer any ebook in Epub/PDF quickly and easily with just a few clicks. 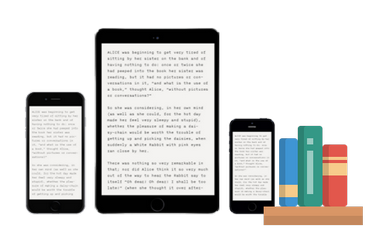 Add, delete or backup your local eBooks seamlessly between Mac and iOS devices. Transfer data between several devices: Connect and manage multiple devices simultaneously which make it easy to share and transfer files between the devices & Mac. You can share music between two iPods, iPad to iPod and etc. Manage iTunes files: Extract data from iTunes backup and manage iTunes backup files. Transfer files from iTunes Library to Mac or iOS devices. One Click Backup and Restore: Manage your files as easy as one click the buttoun and recover your data.